This recipe is fast, fresh and healthy. It's great as a simple, hot summer's night meal made with greens from the garden. 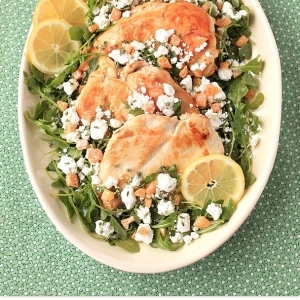 In a resealable bag or a small container add chicken and vinaigrette to marinade for at least 1 hour or up to 24 hours. In a large pot add oil and garlic. Set aside. Preheat grill on medium high heat. Grill chicken until cooked through, about 8 minutes. On medium high heat, cook garlic until it just begins to brown. Add greens and cook until just wilted. Remove from heat and add lemon zest. 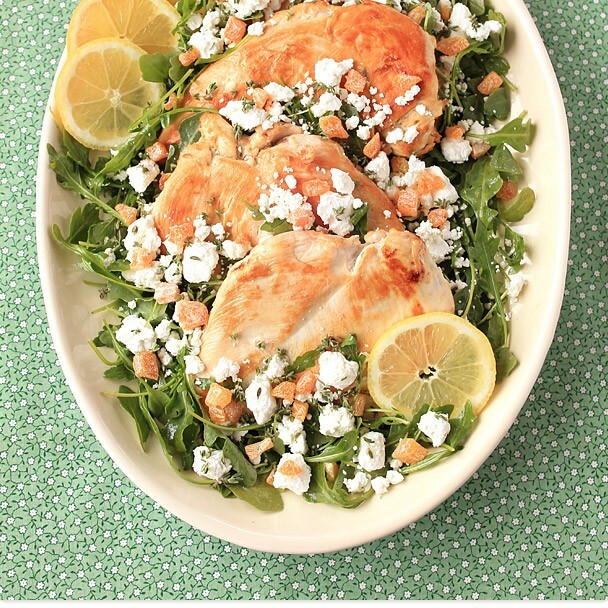 Arrange greens on serving platter, top with grilled chicken and sprinkle with crumbled goat cheese. Serve with lemon wedges.